Your service dog is welcome onboard, and we make every effort to ensure your comfort and theirs. Please note we do not accept pets. A service dog is defined as "any dog that is individually trained to do work or perform tasks for the benefit of a person with a disability." Evidence that a dog is a service dog (such as identification cards, other written documentation, presence of harnesses and/or tags) is not required, but is helpful for our staff and crew. We provide 4 foot by 4 foot relief areas with cypress mulch to accommodate service dogs. Relief areas are provided on a shared basis with other service dogs onboard. For sailings from the U.S., sod can be provided if ordered in advance and is available. Please notify our Access Department as early as time of booking, but no later than 30 days prior to sailing if a relief area is needed. Service dogs are permitted to accompany their owner in all public areas, including dining venues. While in public areas, service dogs must be on a leash, harness or other restraining device. Due to health regulations, service dogs are not permitted in pools, whirlpools or spas. Care and supervision of your service dog is your sole responsibility. It is also your responsibility to provide food and care for the dog. You may bring a reasonable quantity of food and bowls for your dog onboard the ship at no additional charge. If refrigerated space is needed, notify our Access Department as early as time of booking, but no later than 30 days prior to sailing. A copy of these permits must be carried by the guest on the ship, and a copy left with Guest Relations Desk upon boarding. All documentation and immunization requirements are established by government authorities and not Azamara Club Cruises. Please note requirements are subject to change without notice. If you choose to disembark the ship at a port at which your service dog must remain onboard, you must make arrangements to ensure that your dog is cared for. Note that the ship's staff is not required to care for your dog, nor can your dog be left in the stateroom unattended. Guests are responsible for the behavior of their service dog and any damage the dog may cause. A cleaning fee may be charged to the guest's shipboard account. 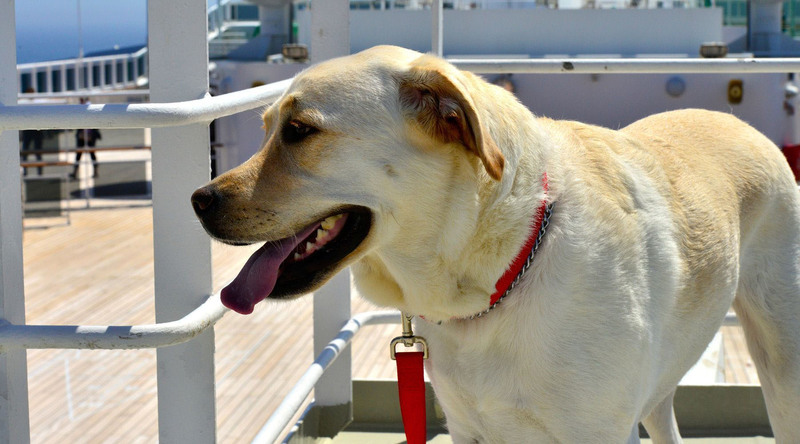 If the service dog's behavior creates a fundamental alteration or a direct threat to safety, the dog may be denied boarding or removed from the ship, along with the owner, at the guest's expense. Examples include: growling, barking excessively, initiating unsolicited contact, biting other guests and/or crewmembers, failure to use designated relief areas, sitting on furniture, eating from the table, etc. If you have an animal that does not meet the definition of a service animal (i.e. a dog trained to perform a task) but must accompany you in order to assist you with your disability, please contact our Access Department at least 60 days prior to sailing. Assistance dogs entering the United Kingdom must meet the rules of the Pet Travel Scheme. You are responsible for ensuring your assistance dog meets all of the rules of the Pet Travel Scheme. Please make sure you have had the procedures carried out in the correct order and your dog’s documentation is correctly completed. We will do our best to assist you in ensuring your service dog is checked for compliance with the Pet Travel Scheme at boarding. Please note dogs that fail checks will not be allowed to sail. If you experience a problem with your documentation upon entry into the United Kingdom, any related costs for either the quarantine or re-export of your pet will be entirely your responsibility. In general, you will need a Pet Passport (for guests from the UK and the EU) or an official third country veterinary certificate (for guests from the US and other countries outside the UK and EU) showing the dog has been microchipped, vaccinated against rabies, and treated against tapeworm not less than 24 hours, and not more than 120 hours, before arrival in the UK (not required if travelling from Ireland, Finland, Malta or Norway). Pet Passport and Third Country Certificates must be signed, dated, and stamped by an Official Veterinarian; this may be different than your local veterinarian. This usually takes extra time. Tapeworm treatment should be arranged at the next to last port of call prior to entry to the UK. In case for any reason the scheduled treatment cannot be done at this port, you will have another opportunity to arrange a treatment at the next port of call.